Let’s face it, Katy Perry’s ploy of burying her previous incarnation of fluffy pop princess complete with cream-filled bras, dancing gummy bears and candy canes was pretty much a way of saying she’d moved on from that particular style. In this new guise, however, she’s already been into the jungle for the ‘Roar’ clip and now she’s headed to the depths of Memphis. Memphis, Egypt, that is. 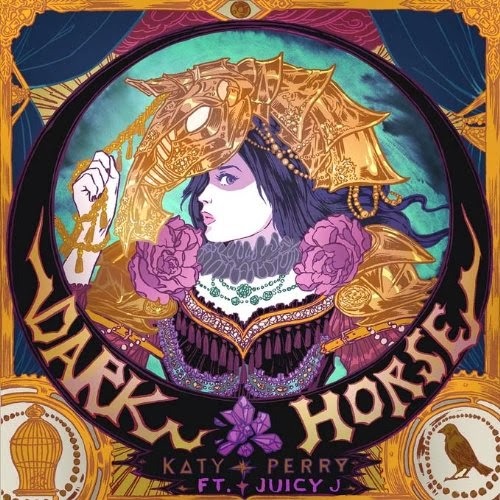 But it seemingly doesn’t matter where Katy films her clips, her fans are always going to lap them up in droves – the almost two million views of the ‘Dark Horse’ clip in a little under ten hours mere testament to the fact. And look, let’s face it, it’s pretty spectacular. The costumes, the set-ups, the colours, the lavishness of it all… We’re especially loving the look Katy’s rocking up against the blue background in that spectacularly ornate gold gown. Firstly, that single cover is beyond amazing. Secondly, that video is brilliant! I love it. Her videos are always high quality, time and time again! Especially her last three. I don’t know how she keeps that standard so high. Wow. It’s a shame her music and vocals are a little weak, but who cares when you have videos that look like this! No other popstar is producing this standard of visuals.